Hostiles is a modern-day Dances with Wolves. But not Dances with Wolves the way we saw it in 1990, when it became an Oscar-winning box office sensation. More the way we see Dances with Wolves today – as a well-acted, honorable, and needlessly heavy-handed drama that could probably be shortened by half an hour. 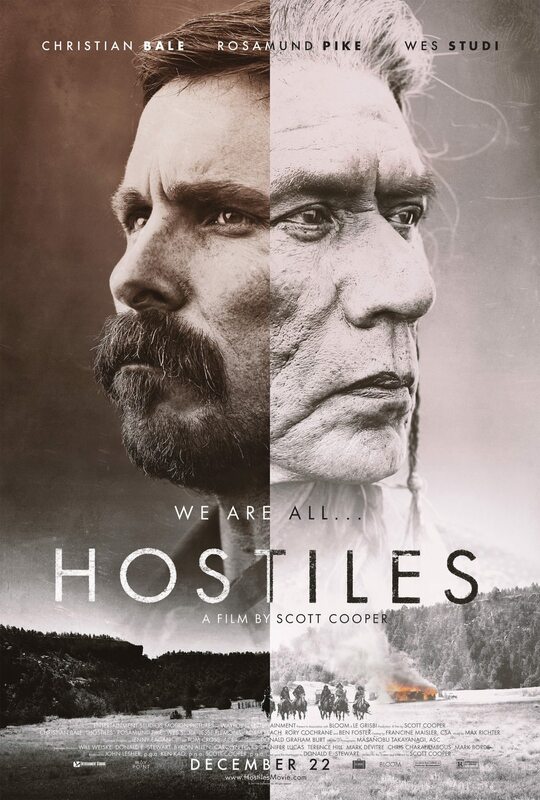 Regardless, we don't get Westerns very often anymore, so for whatever didactic quality Hostiles may possess, its positives make it a sufficiently satisfying entry in the genre, if not necessarily a classic. Set in 1892, the film centers around Joe Blocker (Christian Bale), an Army captain assigned to transport a Cheyenne chief, Yellow Hawk (Wes Studi), and his family from New Mexico to Montana. The chief is dying and wants to spend his final days on his ancestral land. Blocker is none too happy about the assignment, due to having seen the Cheyenne kill many of his fellow soldiers. Nevertheless, an order is an order. He puts together a team of men to help transport Yellow Hawk, in shackles, through dangerous terrain. Along the way, two other people join their party. One is Rosalie Quaid (Rosamund Pike), a woman who witnessed her entire family being slaughtered by Apaches. The other is Sgt. Willis (Ben Foster), a former soldier charged with war crimes. The title of Hostiles is meant to be double-edged. At first, it refers to the way Blocker sees the Cheyenne. He tells his superior officer, Col. Abraham Biggs (Stephen Lang), about seeing Yellow Hawk slit a fellow soldier “from stem to stern.” He therefore views the man and his family with complete distrust, always assuming that they will behave savagely at the first available opportunity. Gradually, though, the film makes it clear that the Cheyenne view the soldiers the same way. They, too, have witnessed the killing of their own. (Blocker, we learn, is particularly adept at scalping.) Over the course of their shared journey, both sides learn to challenge their prejudices. The message in the film, while undeniably admirable, becomes obvious long before the characters have their inevitable awakenings. A more substantive problem is the uneven quality of Hostiles. There are moments that are extremely dramatic and interesting, followed by periods when the pace slows considerably. Director Scott Cooper (Black Mass, Out of the Furnace) has a common problem in his films, which is that he's prone to let things meander. At 133 minutes, Hostiles has several draggy parts that, if removed, would tighten the pace, allowing the point of the story to hit harder. Fortunately, the elements that work are so engrossing that they hold the movie together when it feels like it's going to become too bogged down. Christian Bale is magnetic, giving Blocker a deep-seated anger, while still displaying a compassionate side. The way he repeatedly shows empathy to Rosalie demonstrates that years of intense combat haven't completely frozen his heart. It also paves the way for his eventual reassessment of Yellow Hawk. Rosamund Pike is excellent as the grieving wife/mother, as is Rory Cochrane as Blocker's right-hand man, who grapples with his own feelings about the family they're transporting. Hostiles additionally has some outstanding scenes of tension. The opening sequence, showing the murder of Rosalie's family, is harrowing. Later, there is a tense confrontation with Willis and a daring rescue mission, plus some psychologically riveting interactions between the characters. And even if the message about learning to find the humanity in one's enemies is delivered in a manner that's less than subtle, it retains enough basic power to have an impact. There's a great movie hiding somewhere in Hostiles – one that's a little shorter and got some nuance. The one being released is a good movie with a few flaws. Good's still good, though. Hostiles is rated R for strong violence and language. The running time is 2 hours and 13 minutes.